This unique and extensive set surveys 500 years of organ music, from the Renaissance period up to composers of our time. A wealth of organists showcase their talent and passion for this magnificent instrument, choosing a variety of instruments to perform on from around the world. The first section is dedicated to works from the early period. Composers such as Cavazzoni and De Macque developed the ricercar, capriccio and canzon forms for the organ, complex and fascinating counterparts to the vocal music of the time. Towards the end of the period, composers such as Jan Pieterszoon Sweelinck and Johann Adam Reincken began to expand what would become known as the famous North German organ school. Sweelinck was the first to start a piece with a one-subject fugue, adding texture and complexity, in a style that Johann Sebastian Bach would famously develop later. Composers from the Baroque and Classical periods include such illustrious names as Mozart, J S Bach and his son CPE Bach, as well as Handel, Telemann and Haydn. Alongside these better names, however, come some undiscovered gems of the periods. One of these is Padre Davide da Bergamo, whose modern-day obscurity is astonishing considering he is the author of more than 2000 organ works, a select few of which feature on this release. František Xaver Brixi is a Bohemian composer who has also suffered from neglect, but in his time he was one of the best known composers in Prague and wrote about 500 works in the Neapolitan style. The Romantic period saw the zenith of the organ’s development, as technical advances meant that many new features could be added - the French organ builder Cavaillé-Coll, one of whose magnificent organs is featured on this release, made huge leaps in the organ’s potential by adding a swell box that could operate the swell shutters and a pneumatic assist, coupling all the manuals together and allowing the instrument to go smoothly from a pianissimo to fortissimo without any problems at all. Paving the way for a new type of ‘symphonic’ composition for organ, composers leapt at this opportunity. Mendelssohn’s organ sonatas are some of the most impressive examples and alongside Bach’s works are considered a cornerstone of the organ repertoire. Other well-known organists in this period include Guilmant and Widor, two French organists who straddled the 19th and 20th centuries and dedicated themselves to the promotion and development of their instrument. All these composers lay the foundations for music of our time, and this set concludes with some of the most compelling works of the 20th century. Messiaen may have been French but his compositions diverge sharply from those of his compatriots Widor and Guilmant. Instead, his works are shimmering colours reflecting every aspect of his character: his feeling for light and space, his references to the musical sound of birds and his unwavering Catholic faith. Arvo Pärt concludes the set - his celebrated composition Spiegel im Spiegel is performed by Thomas Leech on the Grand Organ of Leeds Cathedral, a stunning new instrument inaugurated in 2010. This comprehensive set features many types of organs. From single manual chamber organs to grand cathedral instruments, each has been carefully selected to correspond to its repertoire, with a variety of featured instruments from Italy, Germany, the UK and elsewhere. Each organ is listed and full organ specifications for each instrument are available on the Brilliant Classics website. The performers are among the best in their field, with many having garnered high acclaim for previous releases on Brilliant Classics. They include: Adriano Falcioni, who previously studied with Marie-Claire Alain; Roberto Loreggian (previous winner of the Preis der deutschen Schallplattenkritik); Benjamin Saunders and Thomas Leech, British performers who both put the new Leeds Cathedral organ through its paces; and Joseph Nolan, here performing on the Cavaillé-Coll organ in La Madeleine, Paris, who has studied under Marie-Claire Alain and Dame Gillian Weir. 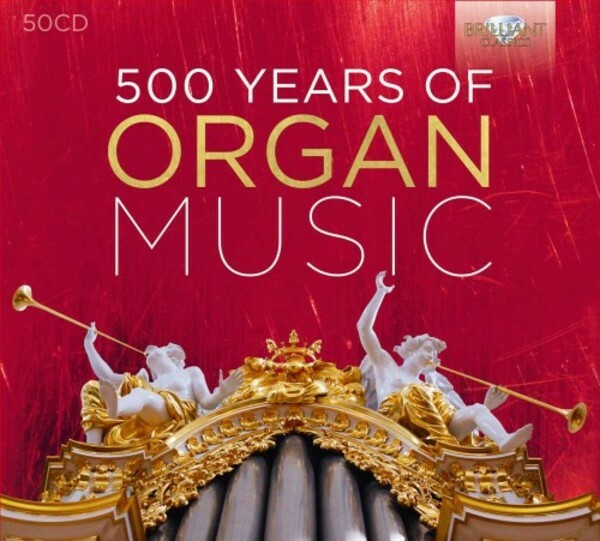 Scintillating performances, mesmerising organs and the largest variety of composers ever brought together on one organ release: this box set provides an overview of unprecedented scope and diversity, with known and unknown gems. It truly is an unbeatable tribute to the ‘King of Instruments’. 4. Quien llamó al partir partir? 4. Recercar secondo in G Minor, F 9.02. 6. Recercar terzo, F 9.03. 8. Recercar quarto, F 9.04. 14. Recercar settimo, F 9.07. 16. Recercar ottavo, F 9.08. 8. Toccata del secondo tono, Ch. 236. 9. Canzon 'La spiritata', Ch. 186. 10. Canzon 'So -Sol–La-Sol-Fa–Mi', Ch. 191. 16. Lieto godea sedendo, Ch. 113. 1. Fantasia chromatica in D Minor, SwWV 258. 3. 6 Variatons on 'Mein junges Leben hat ein End' in A Minor, SwWV 324. 7. Tabulatuur-Boeck van psalmen en fantasyen: Psalm XXIV. Verse 2 à 4. 9. Ballo del Granduca in G Major, SwWV 319. 7. John Reading: A Trumpet Air, No.1. 12. John Reading: A Trumpet for Air, No.2. 13. Aus der Tiefe rufe ich, BWV 745. Sonata No.4 in B flat Op.65 No.